Today I won’t go into depth on the hows and whys of our soap recipe, but I will give you one. I want to cover the basics of how to get ready as our primary focus. If you have long hair please pull it up in a clip or bun or something. The worst thing to happen is to have your hair fall into your work. Please wear closed toe shoes. If you spill during your soapmaking session then washing a pair of sneakers is easy, trying to clean up toes in flip-flops is dangerous. Wear a long sleeved shirt. Long sleeves keeps your skin protected, and when a large splash occurs you are more likely to remove the wet clothing than if you are wearing a tank top. Don’t wear overly loose clothing, comfortable is best. Excess fabric can easily get in the way. Long pants please. For the same reasons as the shirt. Wear goggles. Anti fog is the most helpful. You do not want to get a splash of lye in your eye. If you wear eyeglasses get a pair of goggles that will fit OVER your vision correction gear. Don’t forgo the goggles and claim your eye glasses are sufficient. If you do get splashed in the eye, flush with adequate amounts of water (about 15 minutes) and seek immediate medical attention. Don’t think you should wait until the soap is finished. Just GO! your elbow. Or worse, flowing up to your armpit! Now that we have covered our clothing and protective gear, let’s move on to mixing lye. Lye mixing isn’t hard. Start with cool water. Never stir lye granules into hot water. You will notice the water gets very hot after the addition of the lye. through the blades, then up and around again. If I left the immersion blender in an upright position I would only swirl the mixture around and around, leaving fat to rise to the surface and not mix with the lye solution. As you can see I haven’t spent a lot of time. I also haven’t talked about temperature. The temperature is tomorrow’s discussion. Send comments to us through the blog or through our Contact Us link. See you tomorrow! Feel free to e-mail us any questions you have. Properly folded cuffs on gloves. Melted oils ready for lye solution to be added. Lye solution added to the melted oils. No oil floating on the top. Pour soap into the mold. I weighed all the oils into the plastic bucket. I would weigh one oil, tare the scale and then weigh a new oil into the same bucket. The scale would read something along the lines of 6 oz for the soybean, tare the scale (0 oz), 4 oz for the coconut. 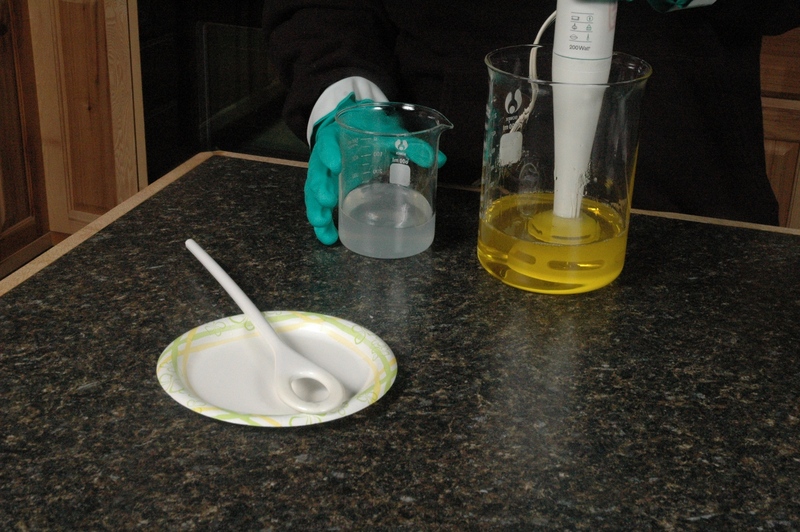 We showed the oils in the glass beaker, so you could see what the oils looked like from a side view. Unfortunately, white plastic buckets are not easy to see through! 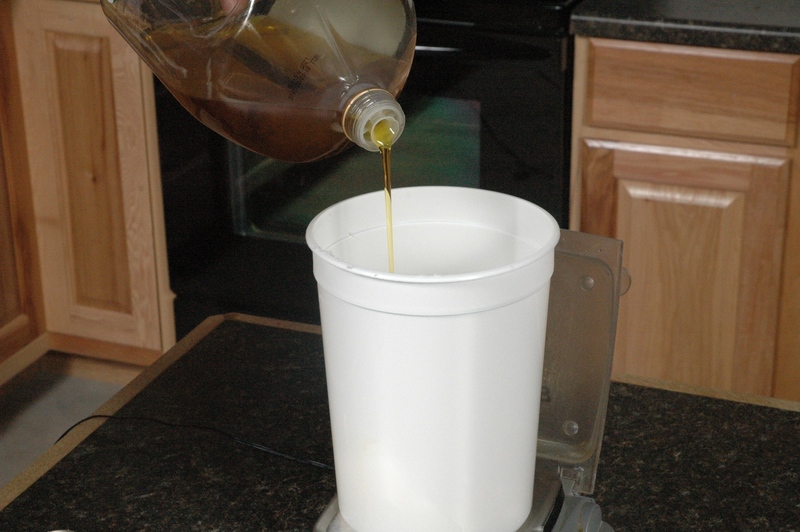 The 87 oz plastic bucket that we showed weighing the oils into is fine to melt oils and add the lye to your oils. We use that bucket all the time when testing fragrances. It is not necessary to weigh each oil separately. I think it is easier to weigh all the oils together for small batches like we made in this post. question – what kind of tap water do you have (well,city water or water softener)? We are on city water. We live in the high desert and our water is hard. We have NO water softener in our test kitchen. 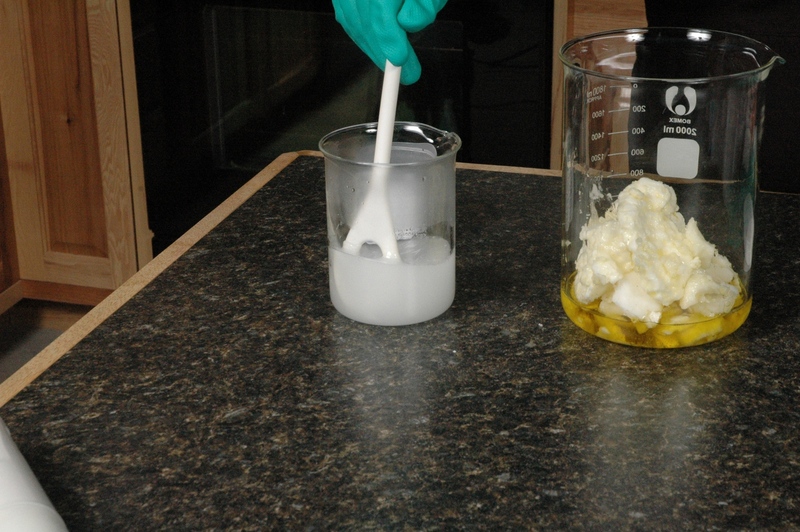 This soap will not have a noticeable difference using this type of water vs distilled water. It would be nice to include what size all the containers need to be. I did find the organizer size – it’s 3″ x 9″ if anybody else needs to know. I just guessed what size measuring cups to buy. I hope that a 4-cup and 1-cup measure will do. I have shortening that is a mixture of hydrogenated soybean, cottonseed, mono and diglycerides would this work for this recipe I am a first timer so pls help. I would like to know the answer to your question too. I see it was never answered. Does anyone have the answer? Let me check! I should have an answer by tomorrow! I made some soap and left for saponifiction for three weeks but found later that the soap was’nt very hard I decided to keep it in the fridge for some time and it became hard what’s really the cause? Have I made a mistake somewhere? Igredients used are as follows sunflower oil 950g olive oil 50g caustic soda126g water300g 15ml essential oil. Don’t worry! You didn’t do anything wrong. Your soap is just fine. 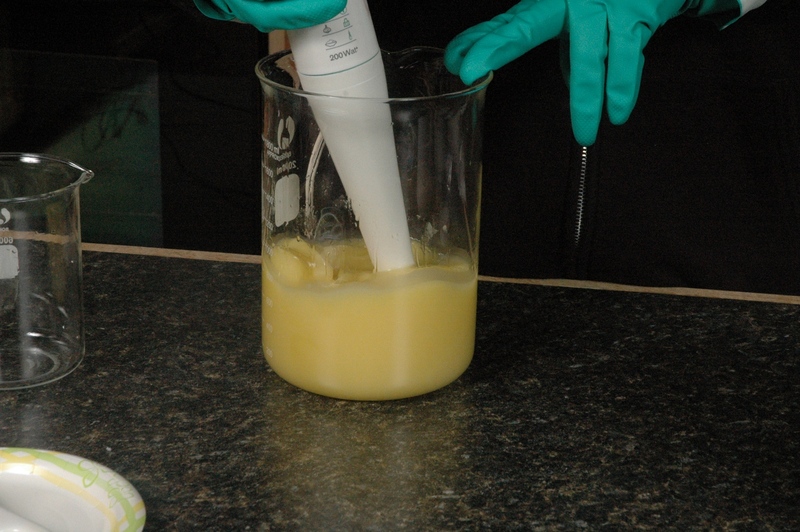 You chose some oils that are liquid and make a softer bar until the bar has been allowed to dry or “cure”. The refrigerator actually help speed the curing process because it draws moisture from items in your refrigerator. If you want a firmer bar sooner, I would suggest adding Coconut Oil, Palm Oil or Palm Kernel Oil to your formulation. 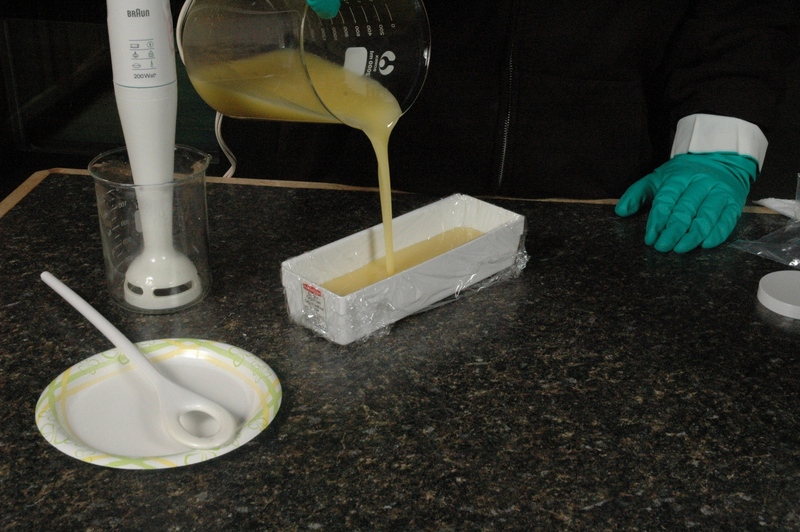 It will give you a harder bar about 24 hours after you pour the soap into the mold. It will continue to firm as it cures. P.S. Welcome to the soaping addiction! Kia ora, new to making soap, however have read a lot and had your experience too. Apperently olive oil requires a longer soaponification, anywhere up to 8 weeks. So let it rest until hard, no rush they say, it is also said to be lovely when left longer. Please let me know alternative(plant origin) for shea butter.Is it possible to make soap without solid fats? Mango butter. 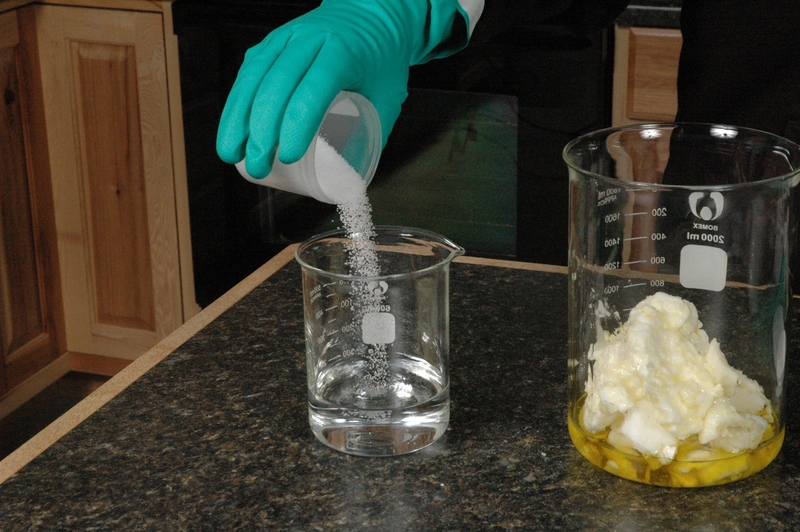 Solid fats help make better soaps, but soap can be made without solid fats. Look at Castile soap for example. Hello! I am loving your website! 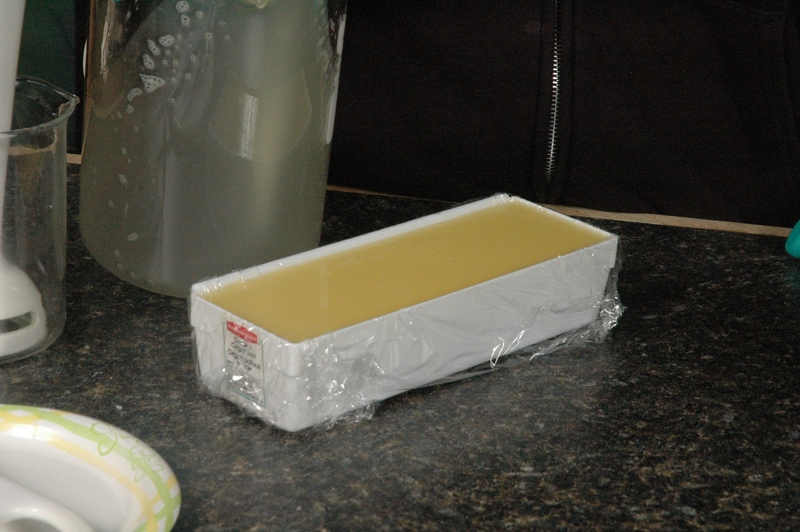 It has been incredibly helpful to me trying to learn all I can about making soap. I am going to attempt my first batch shortly, but had a couple questions. A lot of your recipes call for hydrogenated soy bean oil. I was wondering if I can swap that out for avocado oil with out any problems? I noted the saponification value is only 3mg off. My other question (not for soap but for lip balm) is do you suggest any specific products that are a natural sunscreen? You do not want to replace a solid oil with a liquid one. Hydrogenated soy or palm oil or tallow or lard will work well as the base oil in this recipe. Sunscreens make a lip product an over the counter drug and that is not something we deal with at all. I am sorry. As far as lye it is best to call our office and we can determine where you are located and suggest how you can find a local source. I’ve begun the exciting hobby of soap making and had a very successful first attempt. I gave some to my niece who said she can only use gluten free soap. Is there such a thing? It never occurred to me that soap would have gluten. I’ve heard of vegan but not gluten free. Might you have a recipe or a suggestion? I’d like to make her some soap that she can use. Thank you! I can’t think of a soap that would contain gluten. Do not add grains to your soap and you should be fine. If you are just making fixed oils into soap then do not worry about gluten. Gluten is a water soluble material and not an oil soluble. This is one of those things that makes me scratch my head and wonder what the issue is that would cause her to say this. If she has gluten intolerance then that relates to consumption of gluten and not on the skin. If she has an allergy to certain grains then she should be asking for soaps free from those ingredients. I’m just not understanding. I have made a fewl batches of soap that turned out great. Then I heard that I could pre mix the lye/water solution and save time and effort. I premixed the solution at 6-61/2 % and used my regular recipe but the soap is still soft after a month. Is the problem the pre mix, or not heating the pre mix prior to adding to the oils, or…?? Also, can the soap be salvaged? Will more time result in a hard bar? I sm as a beginnet and I just start to make my own soap. Can you tell me how to use a calculator soap. Our Lye Calculator is very helpful. Go to TheSage.com and use the link to the Lye Calculator. It is so simple! Cheers! Thank you for your amazing instructions and all your tips on your blog, I have just started making soap and I’m completely hooked so I know your website will become invaluable to me! I have a question, why is it that some of my batches come out if the mould after 24 hours and are still sticky? They are squishy and really hard to cut. This has only happened to some of the batches, and others using the same recipe are fine. Any ideas of where I am going wrong and what I should do are greatly appreciated! The reason is higher percentages of oils that are slow to saponify and incomplete saponification. 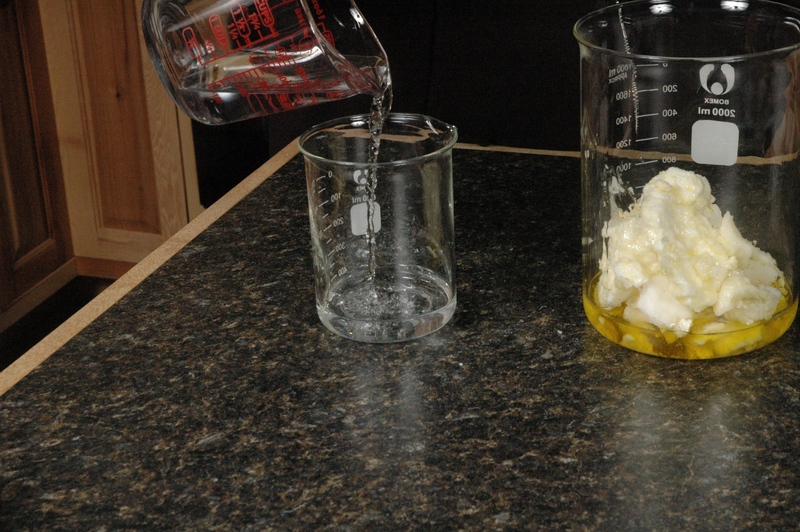 If you use temperatures that are a bit higher adjust your recipe to have oils and fats that convert more quickly then your soap will be much firmer upon removal from the mold. I am like 5 minutes into the soap making thing. 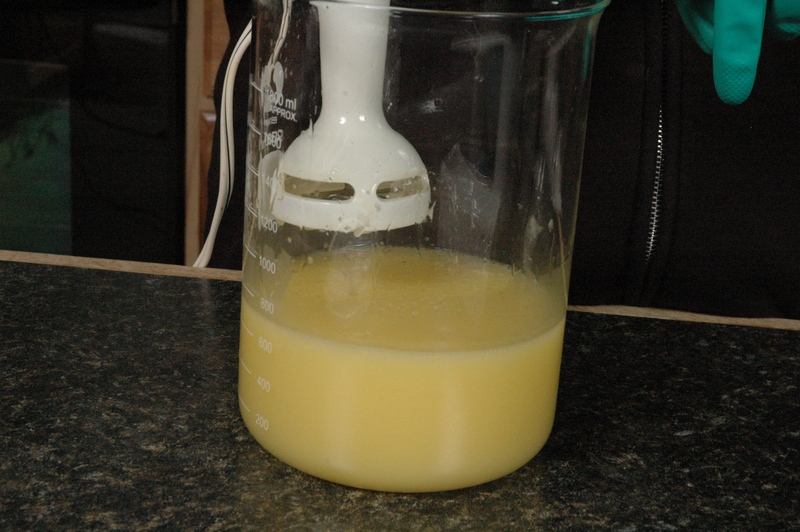 Regarding the immersion blender–is this just a standard one like you get at Walmart? Also, I live in TX. Where can I get lye? 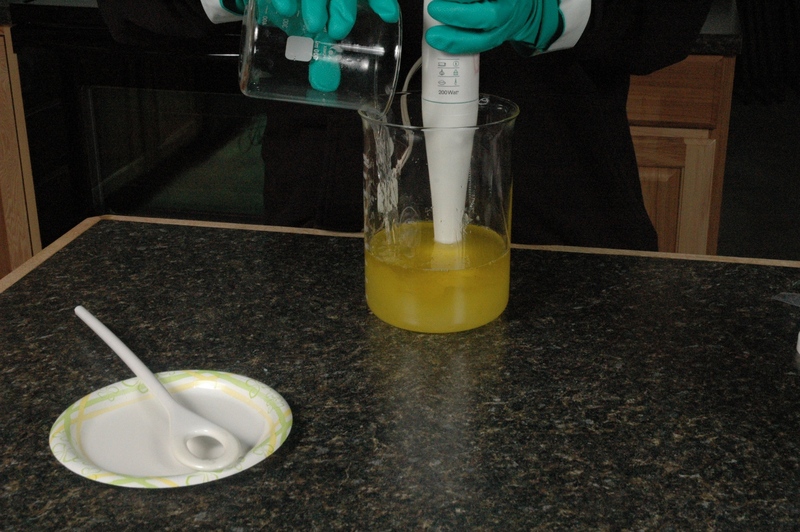 An immersion blender can be found all over town. I even saw a very nice Cuisinart at Kohl’s. Get a quality name because cheap dies quickly. 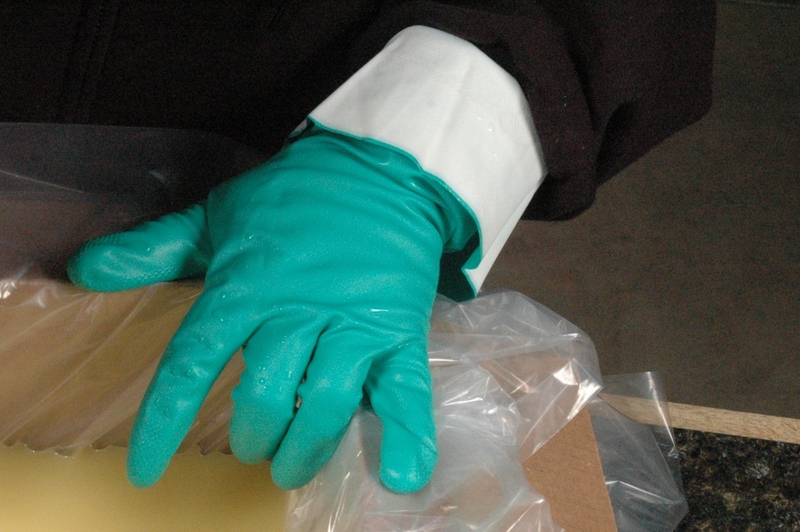 Check your phone book for lye under Chemicals. You can also call the local high school and ask the chemistry teachers where to find small quantity chemicals. Which oils are ‘fast’ to saponify? Are you having problems with certain oils? There are some that are very temperature sensitive such as jojoba, castor, beeswax and lanolin. This is just a short list of items that can be sensitive. I am brand new to soapmaking, but used to be an analytical chemist (now a Montessori teacher). My friends taught me how to make a beautiful soap yesterday, but I’m confused by how she measured the ingredients. Some things were measured in grams (the dry stuff), but then she measured the water in ounces (I thought)…poured out a 16oz bottle of water and called it 16 ounces. Help?! Water is a variable ingredient. It moves all the other items around and makes things mingle together. It must not be precise, nor will it remain in the soap in an amount equal to what was used to make the soap. Most of the soap (70% or more) will evaporate. 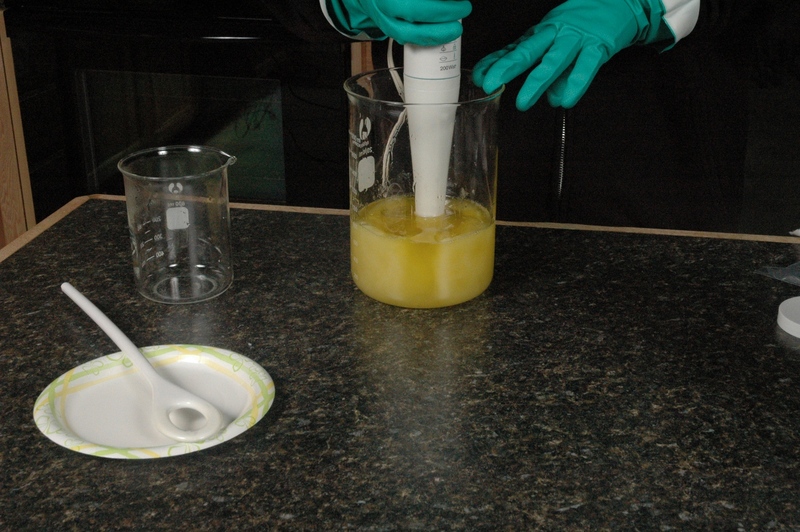 I am writing to ask why do my soap thicken within the first minute of stirring my mixture. I stopped using the stick blender because it will get so thick so fast that I barely have time to get the mixture into the mold. If I stir the mixture it still will get thick in about two to three minutes. How come it isn’t creamy like the soap I see on most websites. I don’t have time to make it pretty! Thank you in advance. What oils are you using and what temperatures are you starting with? This recipe is in ounces. Van I use vegetable shortening instead of soybean hydrogenated oil? My name is Peace and I am a newbie in soap making.I just made my first batch of soap but it went bad and i cant seem to pinpoint where i went wrong. While stirring to get trace the soap became too thick in few seconds, after 24 hours when i un- moulded it, i realised there was fluid inside and it wasn’t all smooth like it ought to. Please what do you think i didn’t do right? The temperature was room temperature. i do not have a thermometer, so i allowed it to cool very well up to room temperature. You had a batch that seized up. This is normal for batches done at room temperature with sensitive materials. Try setting a tea kettle on the stove and adding a touch of boiling water should you see this again. In the meantime, use temperatures that are a bit warmer so you don’t have this unexpected mess. 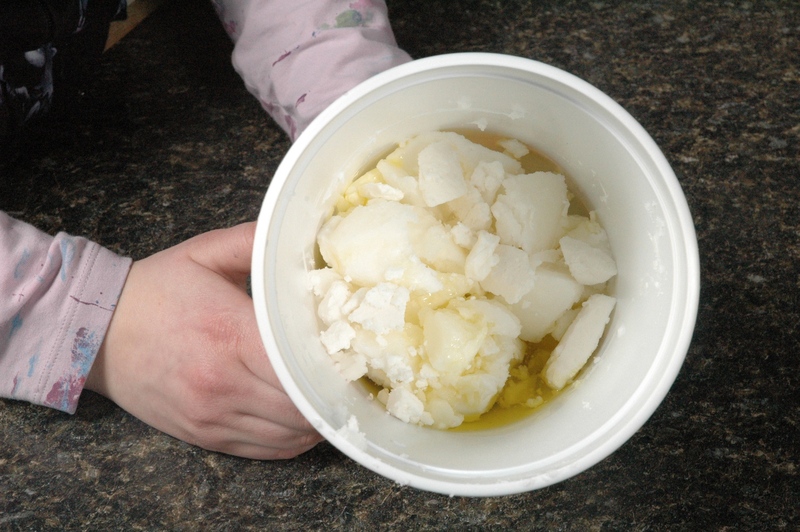 Please can you help me with a a recipe for making simple Laundry Bar Soap? I am still trying to perfect in soap making, this way i can make good soap for sale to enable me get my hands on something. Thank you for all the helpful information! I found the calculator very helpful and tried my first batch of soap today. I live in West Africa and can get Shea butter and Palm kernel oil easily and cheaply here, so that’s what I used. It all seems to be working! So I would like to know if it’s alright to simply leave the newly poured soap in the open air for the first 24 hours or do I need to cover them? Another soap blog said to cover with plastic wrap and then with a towel to help it cool more slowly. I’m in 85+ degree weather. Thanks! I am so glad that you are starting your adventure into soapmaking! The new poured soap does not need to be covered unless you are worried about outside contaminates such as dust particles. Also, you may want to cover the soap if you have curious pets or children. I hope this helps! CAN I USE ONE KIND OF OIL TO PREPARE A BETTER FUMMING SOAP ? There are 3 oils that we highly recommend for lather, they are coconut, palm kernel, and olive.